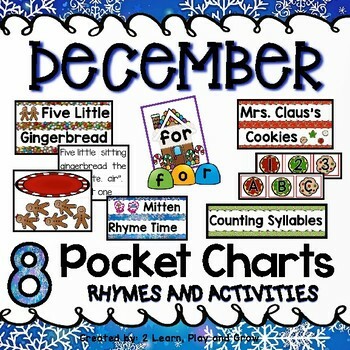 Do you have pocket chart rhymes and activities ready for December? These are songs, rhymes and activities are full of interactive learning with fun gingerbread men, Christmas, Winter, mittens and lots more. 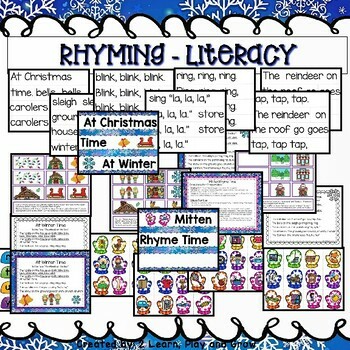 With FOUR rhymes for literacy AND FOUR learning games and activities. Your kids will love their pocket chart center. These resources makes it so quick and easy to promote literacy and math with pocket charts. This month you'll be ready for circle time or morning meeting in no time. There are 8 activities for December. Each week you will have BOTH an engaging interactive literacy or math activity and new song or rhyme to share with your students. Differentiation ideas are provided for most of the activities and they are perfect for Pre-K and Kindergarten. Everything but the pocket chart is included! No wasted effort or extra materials needed. Just print and cut and laminate if desired. Did you know you don’t even need to use a pocket chart for most of the activities? We often use them as magnet board activities. Just cut magnetic strips, stick on the back and you'll be ready to have movable pieces for your magnet board. Song/Rhyme: At Winter Time– (or At Christmas Time) Both options are included. This is a cute rhyme about blinking lights, and crunching snow. Like “The Wheels on the Bus. Activity: Mitten Rhyme Time – Children will match mittens to find the rhyme to many CVC words. Song/Rhyme: Five Little Gingerbread– A really cute rhyme about five little gingerbread that become the children’s lunch. 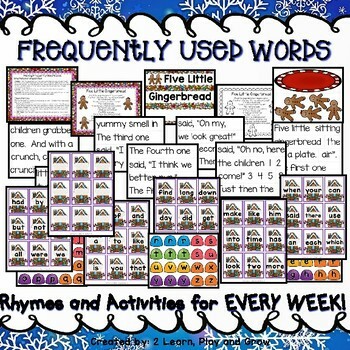 Activity: Frequently used words – Choose a gingerbread house and make the word using the gum drop letters. Includes nearly 100 words and a blank page for you to print and right your own (not an editable pdf). Song/Rhyme: Mrs. Claus’s Cookies – A fun interactive rhyme to reinforce letter recognition. Includes upper- and lower-case letters in color and blackline. Activity: Cookie Sorting – Differentiate for your children. Options include sorting letters and numbers or Even and Odd numbers. Other options, put cards in alphabetical order or numerical order, finding the missing number, etc. 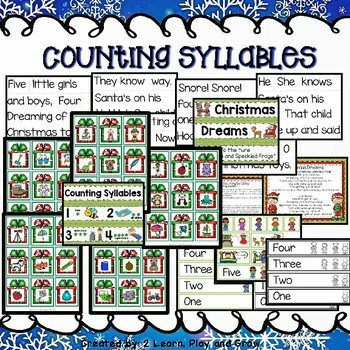 Song/Rhyme: Christmas Dreams – This rhyme reinforces counting backwards from five and literacy skills. Activity: Counting Syllables – Sort the gift boxes of toys into groups of 1-4 syllables. I hope your kids have a fun and educational month! Keep on the lookout for January’s Pocket Chart set or get the GROWING BUNDLE NOW at a huge discount. You can look forward to a poem and activity on hibernation, migration and adaptation, winter fun and much more. Make sure you follow me to keep up with all my latest products and to purchase future activities for 50% off for the first 48 hours. Don't forget to leave feedback. I read each and every comment and appreciate your time. Get all of those credits you deserve so you can buy more great TPT products.